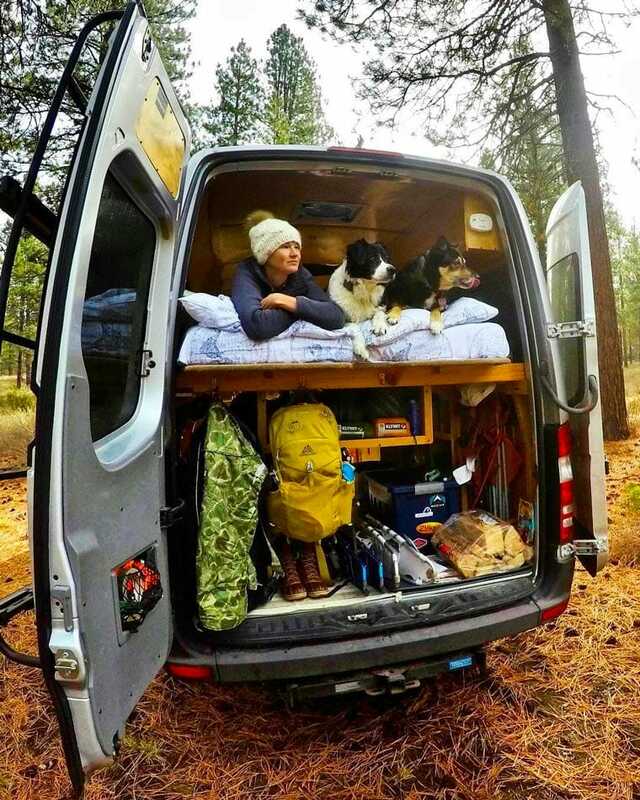 My husband and I have been living the van life with a dog full-time for the past two years. Harper is a 60lb German Shepard mix. She’s four years old and has an endless amount of energy! Bringing Harper along in the van has been a big decision for us. When we first started planning our trip we thought it would only last 6 months. We knew traveling with a dog would be a challenge and would limit our activities a bit. We considered housing her with some friends during our gap-year – but as the trip grew closer, the idea of leaving Harper behind just didn’t feel right. 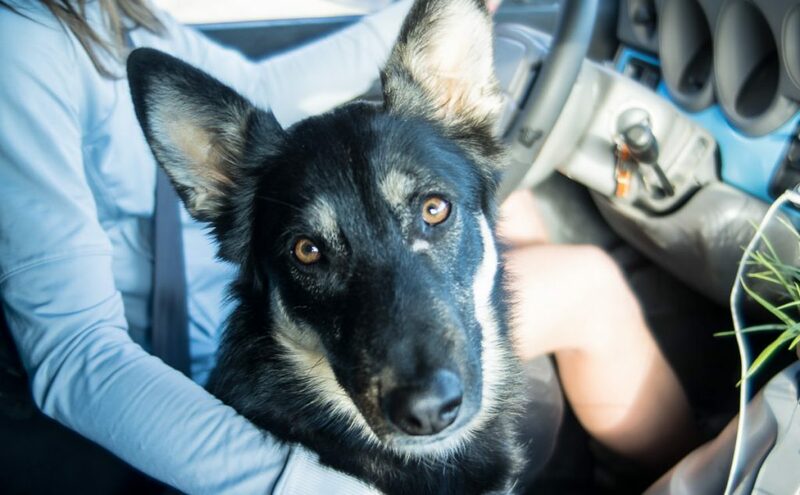 So we’re here to explain some tips for bringing a dog travelling with you! 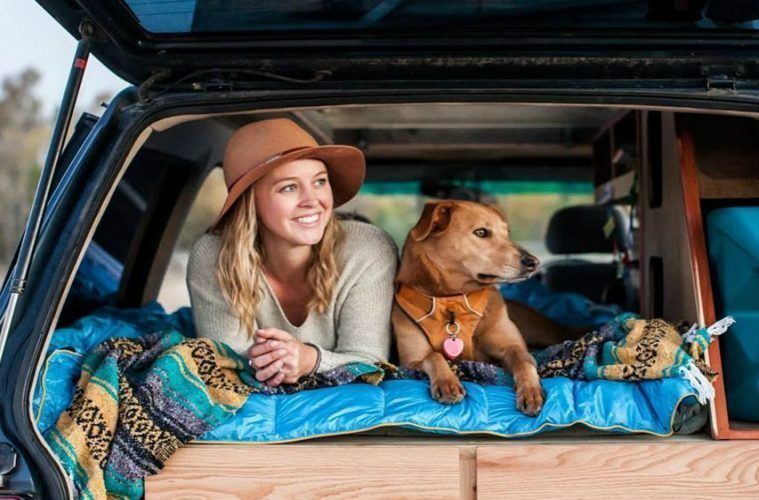 Only a few days into van life, we knew that traveling with our dog has been the best decision we could have made. Harper has changed our adventure in many expected and unexpected ways. Creative camping. Dogs aren’t allowed on many trails within the US National Parks so we spend a lot more time camping and hiking on BLM lands and in state forests. This has been great because the spots are much more secluded, and we get to explore areas that were never on our radar before. More activity. It’s hard to lay in bed for too long when you have a dog nudging you every morning to go out and play! Harper LOVES fetch and she needs a lot of exercise. Having a dog around really motivates us to go for a hike or a run every day. Spending time outside. 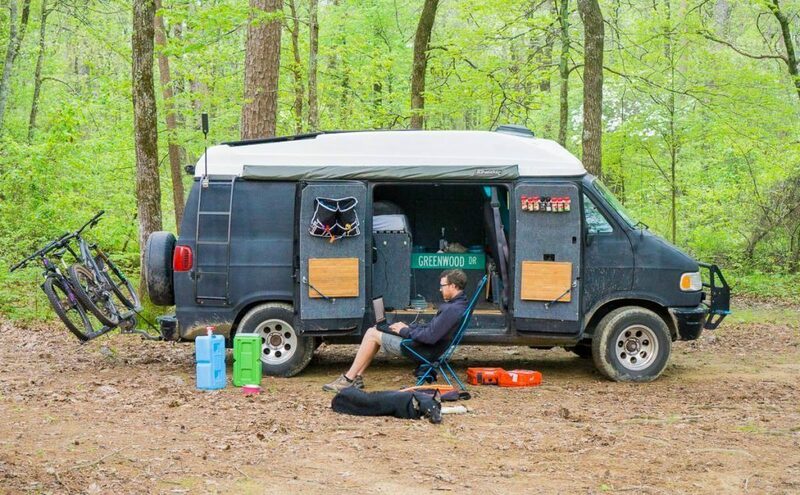 It sounds silly that you might not spend a lot of time outdoors when you’re living in a van. But it’s easy to get sucked into Starbucks for a few hours soaking up the internet. Having a dog around keeps us aware of our surroundings. She’s a constant reminder that we’re doing this to travel and spend time outdoors, and that’s a great thing! Discovering new restaurants and activities. One of our ‘rules’ in the van is no eating out at chain restaurants! We try to cook our food or eat local wherever we travel. Something we specifically look for when we get to a new area is restaurants with a dog-friendly patio. This has been a really fun way for us to try new food – and share the activity with our dog. Saving money. Dogs are not cheap, but overall I think brining Harper along has helped to curb our spending. Without the dog, we probably would splurge more on movies, museums or theme parks as we travel. With Harper, we try to seek out dog friendly activities. That means a lot more hiking, parks and cooking dinner around a campfire. All of these are free entertainment that also keeps us more aware of our surroundings. Less on campervan gifts and more on dog gifts! Although having a dog around has been a great decision for us, there have definitely been a few downsides to be aware of before committing to this lifestyle. Different forms of activity. My husband and I are big mountain bikers. We even designed our van around being able to travel with our mountain bikes. Unfortunately, we quickly found that biking is not an activity that Harper can easily keep up with. We’re also not able to leave here in the van for such long periods of time. Because of this, we’ve had to put our mountain biking on hold for the most part and transform our energy into running and hikes. Missing out on some of the more popular trails. Our van is fairly well climate controlled. We have a vent fan to keep it cool in the heat and Harper has thick fur to stay warm in the cold. Even with these adjustments however, we can’t leave her unattended for long. 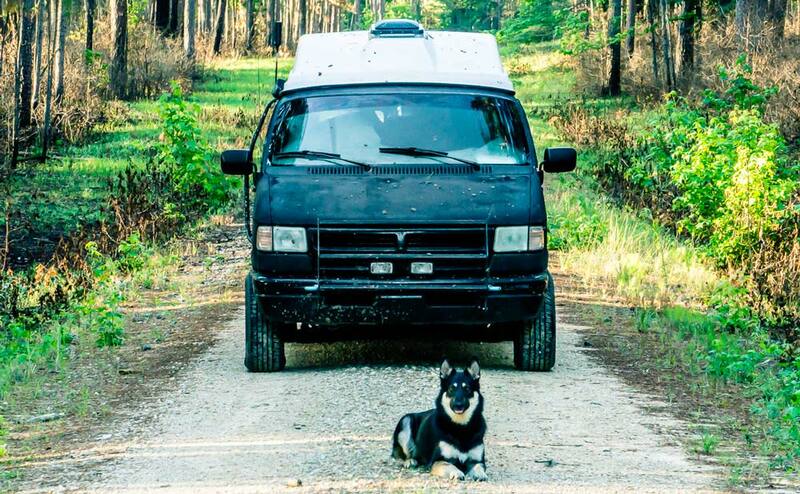 A lot of the most popular trails in National Parks for four wheel campers and vandwellers are not dog-friendly. We have had to work out a system of either leaving really early in the morning to hit the trails while the weather is nicer, or finding a sitter for the days we want to do an all-day hike. Skunks. This is a problem I’d never dreamed we would have to deal with in a van. Unfortunately, Harper has been skunked not once – but twice! Although there are some ways you can try to prevent this, like not letting your dog wander around at dusk… sometimes it just happens. On this last occasion, Harper was skunked only a few feet from our campsite while chasing a ball. If your dog gets skunked on a road trip, mix a generous amount of baking soda and vinegar together in a bucket of water. Add a few tablespoons of dish soap and get scrubbing! The chemical reaction from the ingredients breaks down the protein in skunk smell. Rinse your dog multiple times and the smell should be dampened enough to not get on all of your clothes and sheets. We did make Harper sleep outside that night – but it ended up being a relatively short lived experience! Looking back, I can’t believe we ever considered leaving Harper behind. It’s been so great having her with us. She’s a constant source of entertainment and keeps us active while we travel. If you have a dog, I would highly recommend bringing them along. Just be sure to pack the right equipment and watch out for skunks!